Reaction: After you check reserve, if your hand size is lower than your reserve value, draw 2 cards. 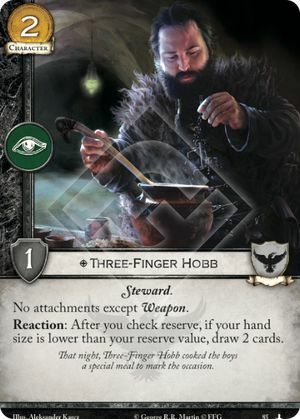 That night, Three-Finger Hobb cooked the boys a special meal to mark the occasion. Hobb triggers after reserve is checked, so even if the draw puts your hand size over your reserve value you do not have to discard.